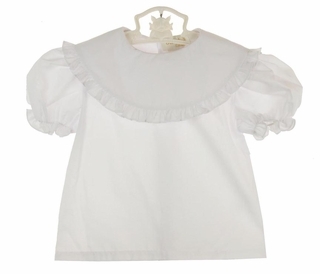 This sweet and simple little cotton blend white blouse is made by Rosalina, a leading designer of quality childrens' apparel. It features a back buttoned closure, short puffled sleeves finished with elasticized ruffles, and ruffled portrait collar that would be perfect for monogramming. 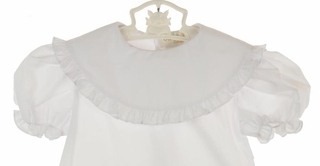 Just darling for your toddler girl to wear under her jumpers or rompers!